John Heywood, a famous writer once said. “Many hands make light work.” Well, crowdsourcing is just that and more. Crowd-sourcing gives professional translators opportunities and creates a window for further knowledge. Mastering a language doesn’t happen over night. Even at a proficient level you should always leave room to perfect your skills by allowing others to review and edit your work. Crowd-sourcing is basically a symbiotic relationship of sorts between developers and translators in which everyone benefits while helping to narrow the language gap online. 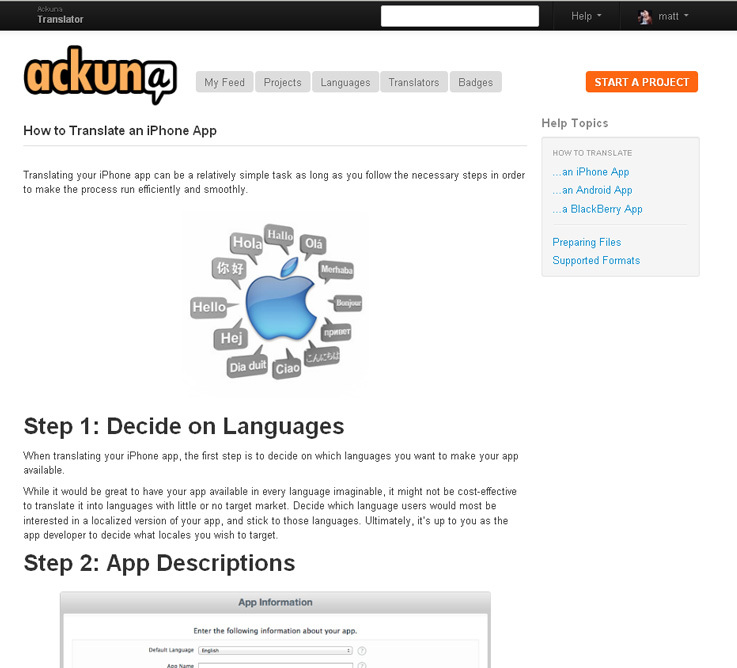 Translation services such as Ackuna take crowd-sourcing technology to a higher level by providing the user with all the power. 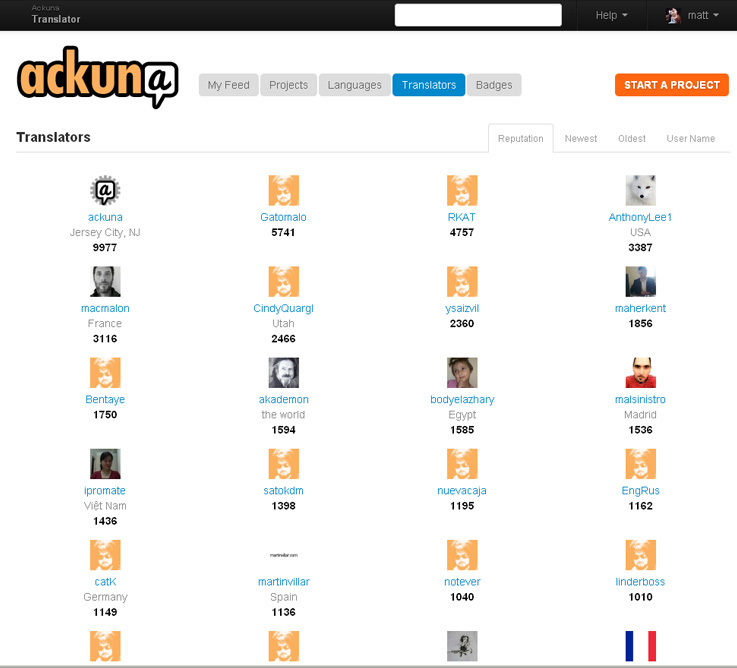 Ackuna’s method allows user’s translations to be peer reviewed. Educators and language enthusiasts are always wiling to contribute their knowledge and experience through crowdsourcing. It is essentially the perfect solution for gathering language experts with something to share with the world. This method allows collaboration on a particular problem and participation on finding the solution without actually being in the same room. 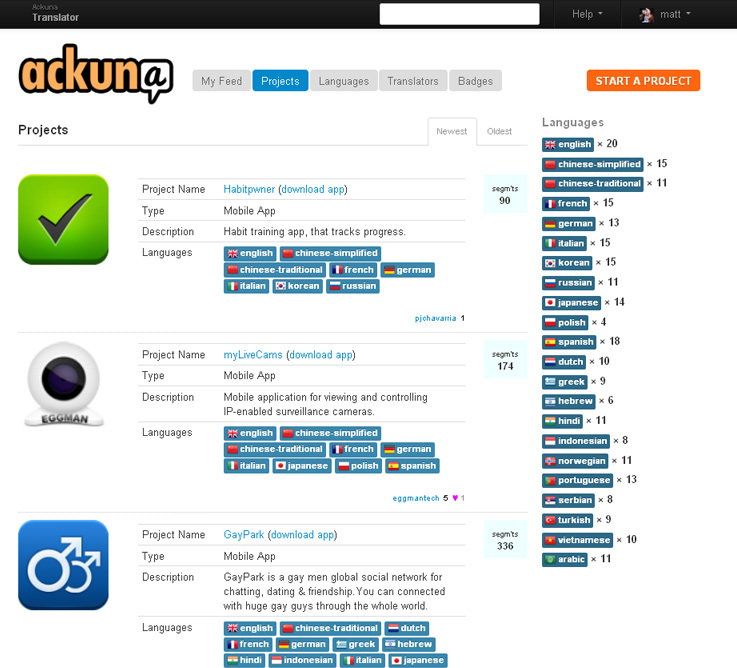 Ackuna makes crowdsourcing easy with just a few simple clicks. The first step is giving your project a name; provide a description and a link to the existing app. Then simply upload your source app’s files and a crowd of volunteers will translate it until you are satisfied. The text will be returned in the same format with the translations integrated directly into the coding. 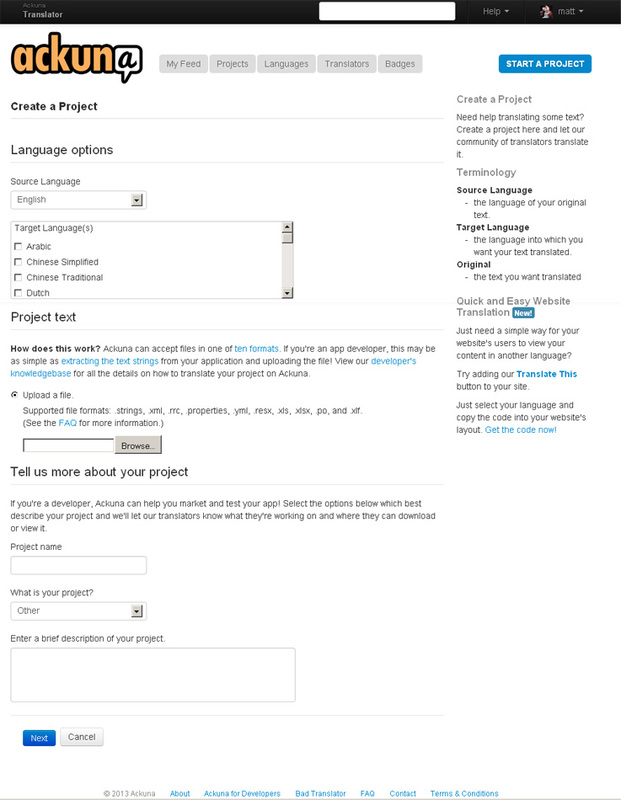 Translators can choose which projects they want to translate by scrolling the projects section by requested languages. For each project, the translator will see a list of terms in the original source language, and then they submit their suggestion for the translated text. Translations are then peer reviewed and rated based on their accuracy. This method creates an algorithm for the translators to be rated which can increase or decrease their reputations online. How is the quality of crowdsourced translations ensured? Ackuna incorporates quality control measures within the system through online reputation points. Similar to Ebay and Amazon’s user ratings, our users are able to rate our translators. This method creates an algorithm which can decrease or increase the translator’s reputation on Ackuna. When a project is uploaded, the user sets the number of votes required to determine if a translation is accurate. Users can vote on translations provided by other users, or submit their own if there aren’t any previous translations or if the ones provided aren’t accurate. The higher a translator’s reputation, the more highly regarded they are on the site. Ackuna also issues badges which are marks of distinction as well, and are awarded to translators for completing various tasks. The more active the translators are, the more badges they can unlock and earn. 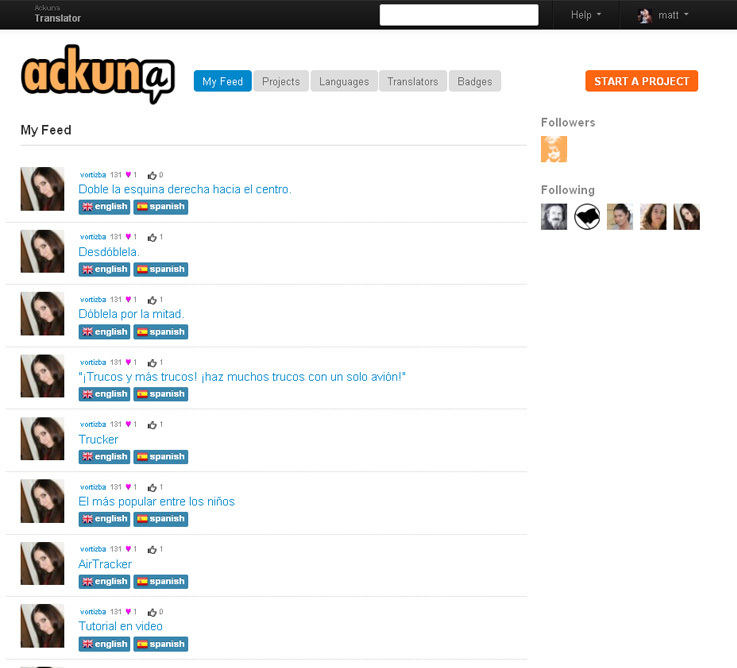 From the translator’s viewpoint, Ackuna is a great community to showcase their skills and promote themselves as a trusted translator. Once translators proves themselves, they can also qualify to work as a paid translator that would handle a professional translation project (one of the upgraded options we offer). 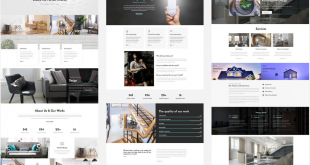 Ackuna is a community where language professionals and enthusiasts work side by side and perfect their craft in the process. In the end it’s a win-win situation with crowdsourcing technology. Students have become actively engaged with crowdsourcing due to the fact that they are receiving feedback on their translations. Experienced translators are then more engaged since people derive pleasure from sharing their knowledge and helping others. year with a B.A. in Marketing Management from Baruch College, Zicklin School of Business.